Well here it is! 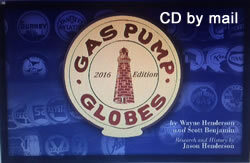 The 2016 Gas Globe CD. Taking orders now. 6000 different globes and oil company histories are so much more complete. Updated pricing, better photos found on hundreds of gas globes, missing globes now discovered with photos. We've added a 1000 new globes since the last CD just three years ago! $40.00 plus $6.00 shipping. This will work on any I-phone, I-pad or Android device. 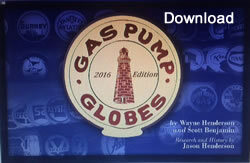 Choose this to download the 2016 Gas Globes e-book directly to the device you are using now. It is in PDF format to be easily read and searched with an e-book reader app like Kindle on iPad, iPhone or Android. You will be set to use this great reference wherever you are with your mobile device. When the download link appears, choose to "Save." This is a 692 MB download. If you have data limits or charges, this will apply. Be sure to have a good Internet connection.